I am ALL about mauve lately! It’s making a comeback! It’s funny how color trends cycle through the years isn’t it? Just like fashion trends I guess (jumpsuits?!). It gives us a second or third chance to try all the colors! I used the Cotton and Steel fish print to pull the rest of the colors in the quilt. Most of the prints are a variety of Cotton and Steel with some basics pulled from my stash, and the perfect berry floral from the line Washington Depot by Denyse Schmidt. I used the fat quarters and made a quick Fat Quarter Friday quilt (the squares quilt from this pattern). I think I’ll keep this one for myself…it’s my only quilt in these colors and will be a perfect pop of color in my house. Speaking of my house…I’ve had oodles of questions about how my cabinets turned out since I shared that I was painting them last October! I’m happy to say that I lived (barely) to tell the tale of painting my honey oak cabinets! They turned out even better than I had hoped they would. Not gonna lie though, this project was a killer…it took me 2 full weeks and so much hard work (and some tears!). I don’t know if I’ll ever attempt it again but I’m glad I did it at least once! I used this free guide pretty much step by step to paint my cabinets, except I only sprayed my doors, and I used a different grain filler. Anyways…for those of you that asked, yes they are done, and yes I’m glad I did it! Mostly I’m just glad they are done and I can get back to sewing. Yay! Wow, thankyou for showing your kitchen, it’s gorgeous! Hope you enjoy getting back to sewing and your quilt is beautiful. I have painted cabinets too. We’re very happy with them. Love your kitchen! We painted our cabinets(grey), got new countertops, and the exact range and microwave that you have! Love it all! Yours is so beautiful…and so much cheaper than a total gut job of kitchen remodel. I love your kitchen. I know it was a lot of work. I do have white cabinets (just that manufactured plastic paint coating cabinets, by Merilat I think) I love my white cabinets very very much. The only thing….. they show dirt 🙃😂 so I do have to wipe those key areas about once a week. I love the way your kitchen looks. Oak cabinets used to be so desirable and 17 years ago, I missed mine from my former house, but not for long. I love the quilt you made. I have a bit of Washington Depot left over too. I am going to use a few strips to make shoe laces, then sort out the remains by color in my stash. 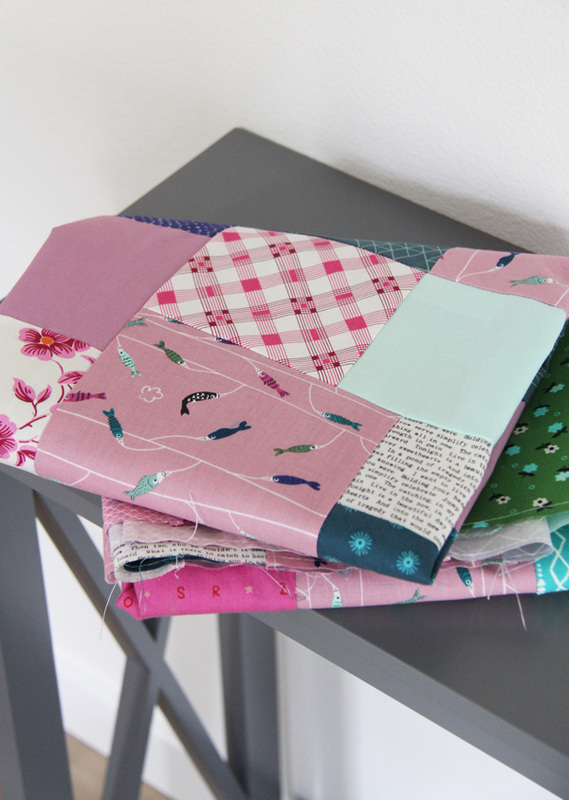 I loved that line, and I really enjoyed making the Cut Loose Quilt, Allison!!! Great idea to make shoe laces! Yes I do have to wipe the white cabinets down once a week or so, but I had to do that anyways with 4 kids plus a husband! ;) Thanks for visiting! I love the Mauve!!! And way to go on those cabinets!!! I have done that once before as well, and there were also tears. Love your new stove and subway tile as well, just gorgeous!!! I love your quilt, the colors are so pretty! I’ve thought about painting my kitchen cabinets…not sure its something I want to tackle. What a transformation on your kitchen! Incredible. Love the counters, too. Love that new quilt, top, too – great zingy colors. 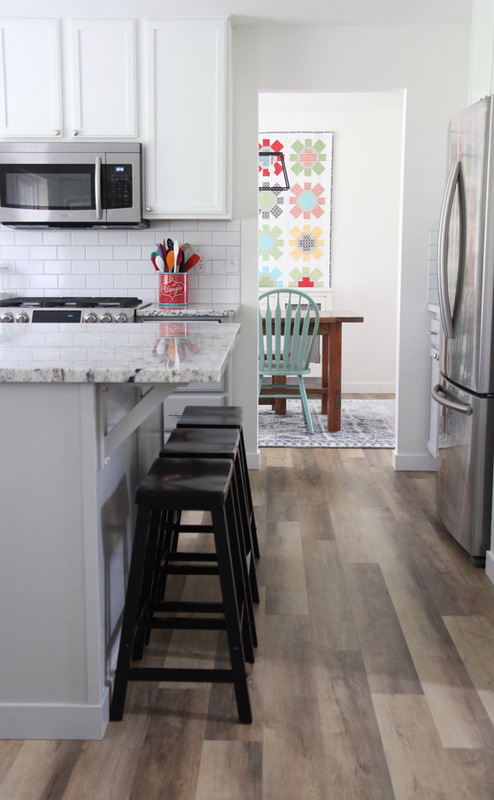 Your kitchen went from blah to fabulous! Congratulations. Years ago I went into a paint store to get some paint to paint my kitchen cabinets. The man behind the counter looked at me aghast and said, “You can’t paint kitchen cabinets.” I proceeded to buy the paint and painted my cabinets and years later, I repainted them a different color. Your cabinets are awesome. Makes me want to paint my new brown cabinets. Oh that’s so funny! Now I bet they are used to everyone painting cabinets! 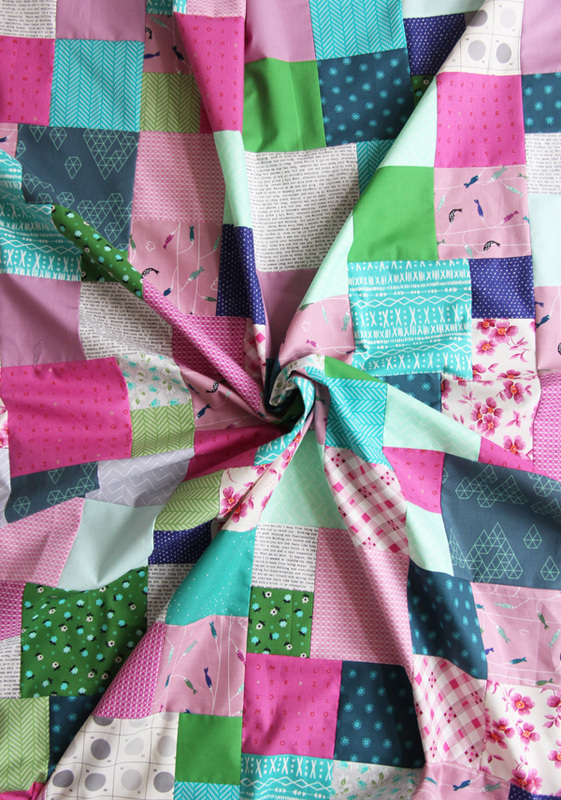 Love your quilt ~ the colors just pop! What a transformation of your kitchen! I think it was worth all your “blood, sweat & tears!” A great update ~ so modern & clean looking! Your kitchen looks fantastic! And I love the quilt too! I love your new quilt because of the mauve. I’ve seen mauve in lots of clothing catalogs that come swimming through our mail. Your kitchen looks marvelous! I’m sure your tears dried once it was finished and all put back together. I hope so, anyway. Although I never would have had the nerve to paint over real wood myself, your kitchen is gorgeous! I am so jealous! I know what you mean…that first coat was nerve wracking! Thank you! So what is your flooring ? i love it !! It’s a Luxury Vinyl Plank, I think the company is TAS and the color is Harmony I believe. Loving your new kitchen! (Whoa, so much work!) We painted our cabinets white a few years ago and I’ve never regretted it. The whole kitchen is so much brighter! That fish print is so cute! I’ll definitely be adding a yard or 2 of that to my stash! I’m been thinking about painting our kitchen cabinets white; they’re already white, just to freshen it up. The task is extremely daunting though! Beautiful kitchen. Where did you get the stools? I painted my kitchen cabinets last summer. It is a killer, but so good once it’s done!! What shade of gray did u use? So many grays look blue. Beautiful kitchen. Hoping mine turns out as good as yours. The gray is called Zephyr and it’s a Cabinet Coat paint by Benjamin Moore, it’s one of their colors. Thanks!